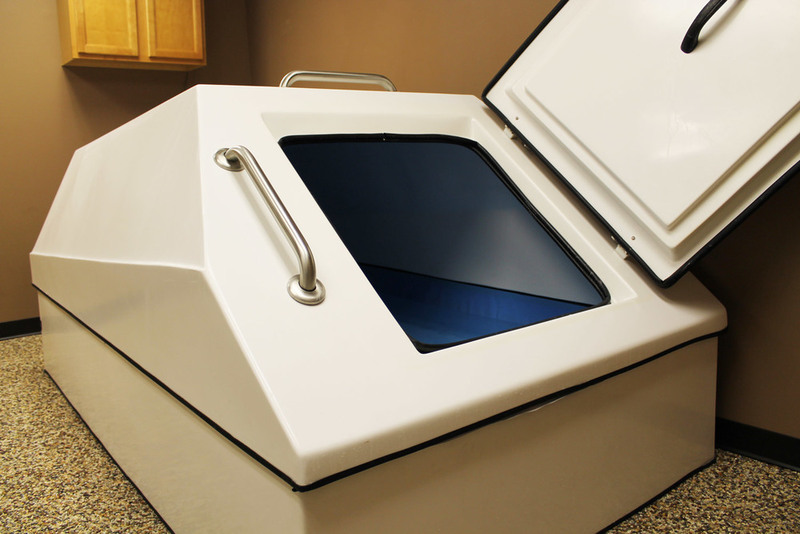 The Oasis Relaxation System is a self-contained system that includes pump, filter, ultraviolet purification unit, and heater. 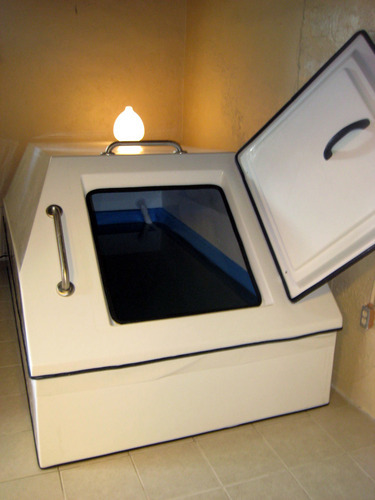 The enclosed fiberglass tub measures 99" long, 56" wide and 45" high on the outside. The inside dimensions are 90" by 48" by 41". 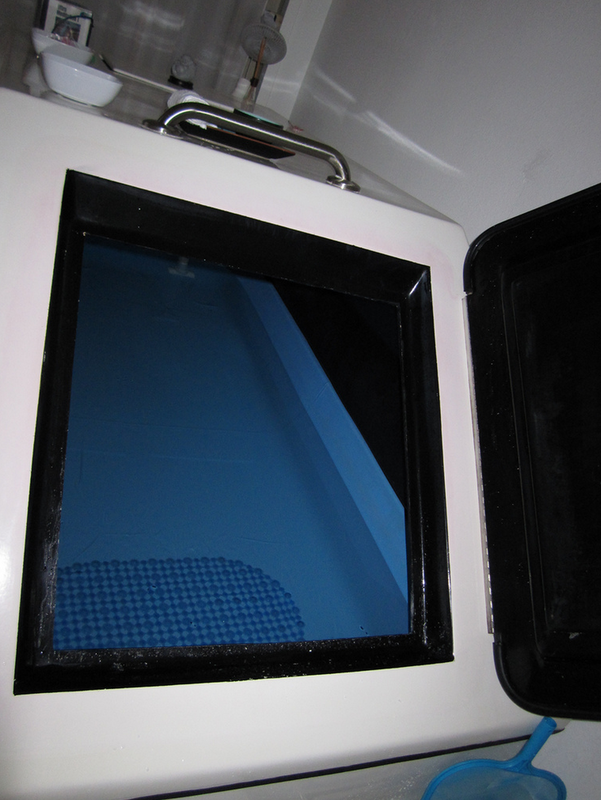 The enclosed tub was designed for easy assembly and disassembly in case of relocation. You can even fill the tub with a regular garden hose, attached to a showerhead or sink faucet. There is no additional electrical wiring or plumbing to perform. The supporting pump filter, and UV equipment can be placed either to the side of the Oasis System or placed behind. This would add from 6" to 36" to the overall length of the tank. The pump and heater connect to a 11OV/15 amp household outlet. (Foreign electrical needs easily met for pump, UV,heaters). Easy entering and exiting of tub. The door is set 22" from the ground at an angle, making it easier to step in and out. Door handles located both outside and inside are for the floater's convenience and safety. Unlike most tubs on the market, the Oasis System has a large sloped roof that reduces water dripping resulting from condensation, by allowing the water to quietly roll down the roof and sides to water level. The double-layered roof and walls are sprayed with insulation which provides excellent sound, light, and temperature control. The tapering of the walls at water level increases the insulation factor and reduces the quantity of salt necessary for flotation. It also improves water circulation during filtering. The bottom floor is sprayed with foam and sealed to prevent temperature loss from cool floors and to create a sound barrier against nearby foot traffic noise and street noises. The Oasis Relaxation System is warranted for a period of one year from the date of purchase against all defects in materials and workmanship for the shell. All other components are warranted by their respective manufacturers. The Oasis System requires less electrical current than that needed to add a 150 WATT light bulb to a typical household. Clean-up can be done with a wet cloth. The Oasis System filters and purifies itself along with the Ultraviolet Purification System, so there is no need to change the solution for up to a one to two year period. The outer surface may be waxed if desired with any fiberglass marine wax. Oasis Audio: Features four internal factory mounted stereo sound transducers allowing you to listen to music or learning tapes while floating. Ultraviolet Purification System: Highly recommended. This system performs the most complete, efficient, and economical method of safe, non-chemical water purification. It greatly simplifies user maintenance and increases salt water longevity. Replacement UV bulbs are available for a nominal fee. Control System: Generally intended for commercial installations. This piece of equipment is a combination timing and audio tape unit that enables the user to precisely control floating length and call back features. Oasis Floating Digital Thermometer: A very accurate thermometer for measuring water temperature.